Future of Ranked-choice Voting: An advisory decision issued by the Maine Supreme Judicial Court last week, which stated that the ranked-choice voting method approved by voters in November would be in violation of the Maine Constitution, has prompted the introduction of two after-deadline bills. At issue is that Maine’s Constitution states that Maine elections can be won by plurality. For those contests with three or more candidates vying for a position, the candidate who receives the most votes wins even if that person does not receive a majority of all votes cast. Under a ranked-choice system, voters choose multiple candidates and rank them in order of preference with a winner only being declared if a majority picks a candidate as their first choice. If a majority is not attained, the candidate with the lowest share of first-place votes is eliminated and second-place votes for that candidate are reallocated. That process continues until a majority is reached. Senator Catherine Breen seeks to amend Maine’s Constitution to bring it into compliance with the measure approved by voters in November. In order for that measure to succeed, it would need two-thirds approval of both the House and Senate as well as an affirmative vote by Maine voters in a statewide referendum. Senator Garrett Mason proposes repealing ranked-choice voting completely. The Veterans and Legal Affairs Committee is expected to take up both bills as soon as they are printed by the Revisor’s Office and referred to committee by the Legislature. Maine Turnpike Authority Proposal Soundly Rejected: The Transportation Committee took swift action on Thursday on a bill that would have abolished the Maine Turnpike Authority. LD 1409, An Act To Initiate the Process of Terminating the Maine Turnpike Authority, introduced by Governor LePage, was defeated unanimously by the Committee the same afternoon of the bill’s public hearing. 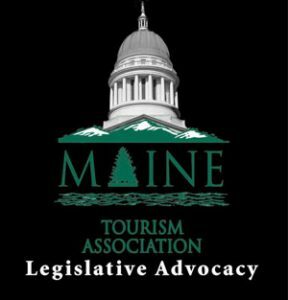 The Maine Tourism Association spoke in opposition to the proposal. Asking individuals to pay a significant toll, possibly as high as $10, upon entering our state is not the message we want to convey to first-time travelers as it will certainly be a deciding factor in the future as to whether or not they choose to vacation here again. Additionally, Maine’s faces $160 million in unmet transportation funding needs annually for maintaining our roads and bridges. Although large bond issues in recent years have helped pay for necessary projects, there is still a dependence on other funding sources to close the gap. Abolishing the Maine Turnpike Authority and merging its duties with DOT will only make this funding crisis worse. Governor’s Minimum Wage Bill Faces Uphill Battle: The LCRED Committee also didn’t waste time in making their recommendations on Governor LePage’s measure that addressed our state’s minimum wage laws. LD 1609 reduces increases to the minimum wage and provides a minimum wage of $11 per hour starting January 1, 2021, eliminates the annual cost-of-living adjustment to the minimum wage, and reinstates the tip credit at 50% of the state minimum wage. The proposal also allows employers to pay a training or youth wage at 80% of the state’s minimum wage so long as that wage is above the federal minimum wage rate. The proposal also addresses limits on mandatory overtime as well as service charges. As expected, the Committee divided their votes along party lines, with a Democrat majority ONTP report and a Republican minority OTP-A report. MTA provided testimony in favor of the proposal and testified in favor of similar proposals earlier this session. Committees Wrap Up Work: Friday was the target date imposed by the Senate President and the Speaker of the House for all committees to conclude their work for the First Regular Session. With the exception of the Appropriations Committee and Transportation Committee, which both are finalizing the General Fund and Highway Fund budgets, the deadline will be met. The Appropriations Committee continues to hammer out details of the biennial budget and has been working closely with rank-and-file leadership on more decisive portions of the proposal, including sales tax expansion, lodging tax increase, three percent surtax elimination, and funding for general purpose aid to education. Leaders are expected to continue negotiations throughout the weekend and next week to try to reach consensus. The budget must be enacted and approved by the Governor no later than June 30th to avoid a state government shutdown. Marijuana Legalization Implementation Committee Continues Deliberations: One committee still meeting and plans to do so for the remainder of the session, if not the entire summer, is the Marijuana Legalization Implementation (MLI) Committee. On Friday, the committee convened to continue their discussions on retail requirements on marijuana establishments as well as municipal approval and control. On Thursday, the Legislature enacted a bill that establishes some of the structure around the recreational marijuana law. The proposal moves regulatory control of recreational marijuana from the Department of Agriculture to the Department of Administrative and Financial Services, allocates $1.4 million to implement the law, and provides $200,000 to the MLI Committee to cover committee expenses including travel and consultant services.